I come to you today to admit that I have a problem. Ever since I figured out how to change the wallpaper in Windows 95, I’ve been hell-bent on updating my devices with a snazzy new background image as often as possible. Wallpaper Hunter: Backdrops gives you a number of ways to search for background images for your iPhone and iPod touch, including a random search feature. Sadly, with the iPhone this can be a somewhat daunting task, leading to a waning battery life and plenty of lost time. Lucky for me, L-bow Grease, the folks behind InterfaceLift, have come to my rescue with some much needed therapy. Backdrops is an app that makes finding great wallpapers a snap. Its essential function is to provide a convenient window into the wallpaper archives of InterfaceLift, which has gained quite a reputation for having a large selection of beautiful user-submitted wallpapers. Once launched, Backdrops offers a few different ways to narrow down your wallpaper search, including Recent, Top Rated, Random, Categories, and Artist buttons. Unfortunately, there is no text-search option available. 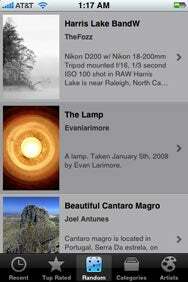 The app displays wallpaper choices as large thumbnails accompanied by their respective authors and titles. You can scroll through 16 at a time, tapping a Load More Backdrops button if you want to see more choices. Selecting one of the thumbnails loads a full-screen preview and a button which allows you to save the image directly to your photostream for use as a wallpaper. Backdrops is a superb replacement to having to sync downloads from your computer or fishing around and saving them within Safari. The app could save hours of fiddling over the lifespan of your device, depending how background-obsessed you are. If I could search for wallpapers by name, this might just be the perfect prescription for my wallpaper obsession. Backdrops is compatible with any iPhone or iPod touch running the iPhone 2.2.1 software update.